XCG 140-8A Excavator Undercarriage must be extremely durable and it is very important to keep the un..
XCG 210LC-8B Excavator Undercarriage delivers outstanding performance in any excavator application. ..
XCG 210LW-8 Excavator Undercarriage excels in all applications and all conditions: standard or heavy..
XCG 220LC-8 Excavator Undercarriage must be extremely durable and it is very important to keep the u..
XCG 240LC-8B Excavator Undercarriage delivers outstanding performance in any excavator application. ..
XCG 330LC-8B Excavator Undercarriage excels in all applications and all conditions: standard or heav..
XCG 450LC-8A Excavator Undercarriage must be extremely durable and it is very important to keep the ..
XCG 60-8A Excavator Undercarriage delivers outstanding performance in any excavator application. 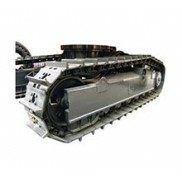 We ..
XCG 88-8 Excavator Undercarriage excels in all applications and all conditions: standard or heavy-du..